A collaboration led by scientists at the U.S. Department of Energy's (DOE) Brookhaven National Laboratory has observed an unexpected phenomenon in lithium-ion batteries—the most common type of battery used to power cell phones and electric cars. As a model battery generated electric current, the scientists witnessed the concentration of lithium inside individual nanoparticles reverse at a certain point, instead of constantly increasing. This discovery, which was published on January 12 in the journal Science Advances, is a major step toward improving the battery life of consumer electronics. "If you have a cell phone, you likely need to charge its battery every day, due to the limited capacity of the battery's electrodes," said Esther Takeuchi, a SUNY distinguished professor at Stony Brook University and a chief scientist in the Energy Sciences Directorate at Brookhaven Lab. "The findings in this study could help develop batteries that charge faster and last longer." Inside every lithium-ion battery are particles whose atoms are arranged in a lattice—a periodic structure with gaps between the atoms. When a lithium-ion battery supplies electricity, lithium ions flow into empty sites in the atomic lattice. "Previously, scientists assumed that the concentration of lithium would continuously increase in the lattice," said Wei Zhang, a scientist at Brookhaven's Sustainable Energy Technologies Department. "But now, we have seen that this may not be true when the battery's electrodes are made from nano-sized particles. We observed the lithium concentration within local regions of nanoparticles go up, and then down—it reversed." Electrodes are often made from nanoparticles in order to increase a battery's power density. But scientists have not been able to fully understand how these electrodes function, due to a limited ability to watch them work in action. 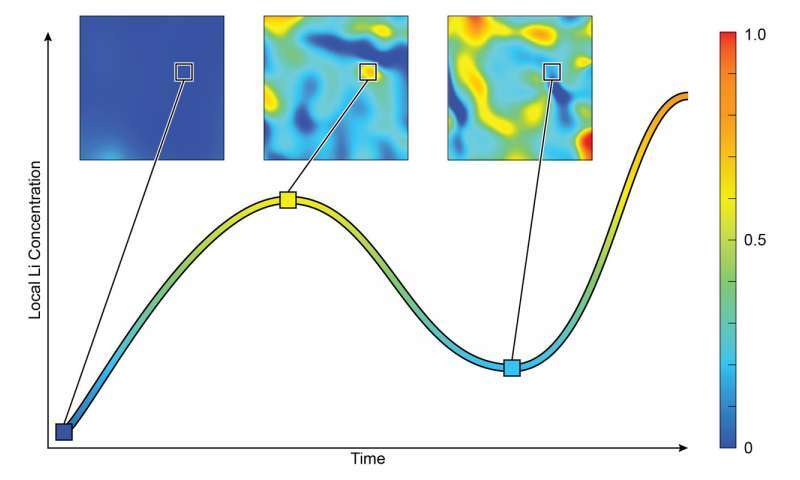 Now, with a unique combination of experimental tools, the scientists were able to image reactions inside the electrodes in real time. Similar to how a sponge soaks up water, we can see the overall level of lithium continuously increase inside the nano-sized particles," said Feng Wang, the leader of this study and a scientist in Brookhaven's Sustainable Energy Technologies Department. "But unlike water, lithium may preferentially move out of some areas, creating inconsistent levels of lithium across the lattice." "Before lithium enters the lattice, its structure is very uniform," Wang said. "But once lithium goes in, it stretches the lattice, and when lithium goes out, the lattice shrinks. So each time you charge and drain a battery, its active component will be stressed, and its quality will degrade over time. Therefore, it is important to characterize and understand how lithium concentration changes both in space and time." In order to make these observations, the scientists combined transmission electron microscopy (TEM) experiments—conducted at the Center for Functional Nanomaterials (CFN), a DOE Office of Science User Facility at Brookhaven Lab, and at Brookhaven's Condensed Matter Physics and Materials Science Department—with x-ray analyses at the National Synchrotron Light Source (NSLS), a DOE Office of Science user facility at Brookhaven that closed in 2014 when its successor, NSLS-II, opened. "Wang's team combined TEM with x-ray techniques," said Yimei Zhu, co-author of the study and a senior physicist at Brookhaven Lab. "Both methods use a similar approach to analyze the structure of materials, but can provide complementary information. Electrons are sensitive to the local structure, while x-rays can probe a larger volume and enable much better statistics." The Brookhaven team also developed a nanoscale model battery that could mimic the function of lithium-ion batteries that would "fit" into a TEM. Computer simulations conducted at the University of Michigan further confirmed the surprising conclusions. "We initially thought that the reversal mechanism was similar to those previously proposed, which stemmed from the interactions between nearby particles," said Katsuyo Thornton, a professor of materials science and engineering at the University of Michigan, Ann Arbor, who led the theoretical effort. "However, it turned out a concentration reversal within a single particle could not be explained by existing theories, but rather, it arises from a different mechanism. Simulations were critical in this work because, without them, we would have made an incorrect conclusion." "Down the road, we plan to use the world-class facilities at CFN and NSLS-II to more closely examine how battery materials work, and to find solutions for building new batteries that can charge faster and last longer," Wang said. "These facilities offer the ideal tools for imaging the structure of battery materials in real time and under real-world conditions." Another daily surprising discovery that can lead to better batteries. One would think that with thousand of these surprising discoveries I am reading about on phys.org, we would have 'significantly' better batteries by now. How many more thousands of discoveries needed until it will be the case. As opposed to surprising number of battery chemistry or physics pHd's? @NoSprings - What metric are you using to justify your assumption that batteries are NOT significantly improving all the time? The capacity/number recharge cycles/stability/etc. of today's batteries are light years ahead of those available even 20 years ago. It takes at least 5 or 6 years before any discovery makes it into any products, it is often longer, much longer. This is true for discoveries in electronics, pharmaceuticals, energy production, almost every facet of our society. That's just the way it is. Here's hoping that battery technology moves beyond Li. Between electric vehicles and the power storage needed to make renewables a 24/7 source of electricity I don't think that there is enough Li on earth to fulfill all of our requirements. "The scientists explained that uneven movement of lithium could have lasting, damaging effects because it strains the structure of the active materials in batteries and can lead to fatigue failure."